Compared to the complexity of most modern avalanche beacons, the inexpensive and ultra-compact Pieps Freeride is refreshingly simple—perhaps a little too simple. The single-antenna Freeride eschews the two and three-antenna designs overwhelming employed by today's avalanche transceivers. Consequently the arrow on the Freeride's LCD display points not in the direction of a buried victim but rather to indicate when the unit is aligned with flux lines. And if that last sentence baffles you, you've probably already got a strong hint that the Freeride isn't your beacon. That said, while the Freeride's interface is simple, its technology is sophisticated. The Freeride uses digital processing to inform you a multiple-burial scenario exists, and it automatically filters weaker signals. Only the strongest signal is displayed until you find and switch off the closest beacon. I must say, the Pieps' automated approach to multiple burials sounds very appealing, as it eliminates the need to learn and remember, for example, elaborate 'masking' features found on other beacons. But consider this: if you've got a large group of Freeride-equipped searchers, the auto-masking feature could theoretically preclude you from simultaneously searching for multiple buried victims, as the search-mode beacons could all lock on the same transmitter. That would seem to rule out the Freeride as the beacon of choice for ski patrol, guides, SAR teams, or other avalanche professionals. So who is the Freeride made for? To answer that question, let's give the manual a quick read and then pull the Freeride out of the box. 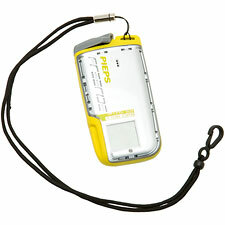 The first and overwhelming impression the Pieps Freeride makes is...it's tiny: a measured 4.0 ounces including one AA battery. Overall dimensions are a very-compact 4 1/4 x 2 1/4 x 3/4 inches. "Small, light, dynamic, cool!" says Pieps, and so it is. Second impression after running a few searches is that search times are noticeably slower with the Freeride compared to a top-rated avalanche beacon like the Backcountry Access Tracker DTS. How much slower? Let's just say it's hard for me to imagine a situation in which I'd rather be searching with the Freeride instead of the Tracker, except maybe a practice session. That doesn't mean, however, that I can't imagine scenarios where I'd rather be wearing the Freeride. In fact, thanks to its small size I think the Freeride is the perfect beacon for in-bounds use where you primarily want a beacon as a transmitting device. Put the diminutive Freeride in your pocket and you won't even know it's there—unlike the much heavier and bulkier BCA Tracker. I also consider the Freeride appropriate where users might otherwise choose to wear no beacon at all. Those situations exist; let's not pretend otherwise. And a slower beacon is always better than no beacon at all. Really the alarming possibility with the Freeride is that it may end up in novice hands—or at least in the hands of users who don't fully understand how it works. Discovering during an actual emergency that the Freeride's indicator arrow doesn't necessarily point toward the victim could easily be a calamity. I say the Freeride should definitely not be your first beacon, and probably not your only beacon either. If you do get one, run a great many practice searches to get a sense of how the Freeride works, and choose wisely when it comes to wearing the Freeride in the field.